Marilyn Minter, Deep Frost, 2016. Courtesy the artist, Lehmann Maupin and Salon 94. If you haven’t already seen the Marilyn Minter exhibition, you’ll need to head there soon. Known for her provocative hyper-realistic works that reflect the murky underworld of glamour and fashion, the American feminist artist is showing her first exhibition in Hong Kong. Exhibiting recent paintings and photographs that have been created with new printing technology, where the image is printed directly on metal, resulting in a brilliant luminosity across her works. 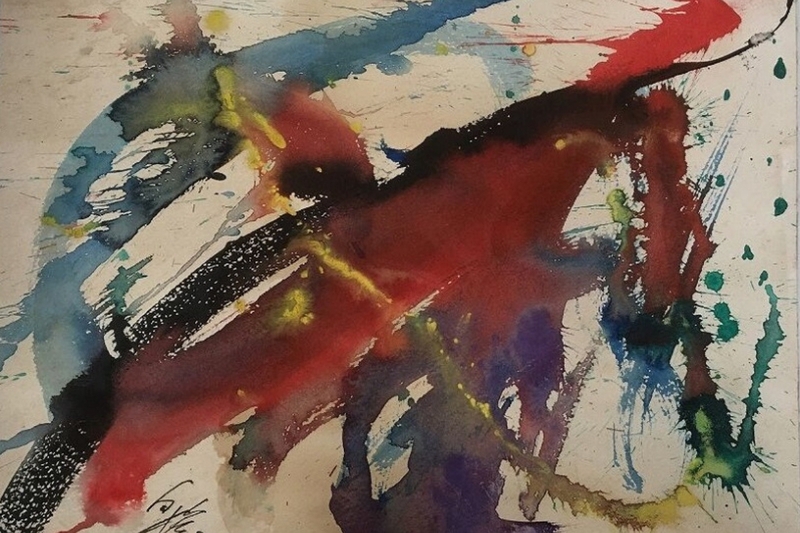 The collective exhibition at Opera Gallery celebrates the best of Asian abstract art while showcasing diverse styles; from ancient Middle Eastern calligraphy and traditional Chinese ink wash painting to Korean scroll painting and paper-making. Pieces by revered Chinese-French artist Zao Wou-Ki and Chu Teh-Chun, as well as Japanese artist Kazuo Shiraga and Korean Contemporary artists Bahk Seon-Ghi and Om Mee-Ai, known for her geometric and layered paintings, are featured in the exhibition. And if that wasn’t reason enough to visit, the gallery will also be donating HK$10 to the Hong Kong Breast Cancer Foundation for every person who walks through the door in the month of October. Tsang Chui Mei, Roaring, 2018. ‘The Other Story’ is focused on storytelling and does so through various works from Hong Kong artists Chloë Cheuk, Tsang Chui Mei and Jessey Tsang. Pushing the boundaries of their usual materials and mediums, all three artists focus on shifting perspectives — inviting the viewer to look beyond visual representation. Within the exhibit, painter Tsang Chui Mei combines textured brush strokes with delicate elements to create vivid scenes, while film director Jesset Tsang has produced her first work in filming dance. Chloë Cheuk, known for her installations, has based her work on ‘raw feelings’ and created a depiction of entrapment in body and mind. Takashi Murakami, The Lion of the Kingdom that Transcends Death, 2018. © 2018 Takashi Murakami/Kaikai Kiki Co., Ltd. All Rights Reserved. Courtesy Gagosian. Presenting new paintings and sculptures by one of Japan’s most influential contemporary artists, Takashi Murakami, the Gagosian gallery presents ‘Change the Rule!’ — Murakami’s first Hong Kong solo exhibition in six years. Often referred to as the ‘Japanese Andy Warhol’, Murakami fuses popular imagery from commercial culture in his works and has fans from Louis Vuitton to Kanye West. In this exhibition, he continues to blend traditional Japanese elements with pop art, anime and manga to connect past and present, east and west, technology and fantasy. Lau Wai, I’m Just Wan Chai Girl, 2018. This group exhibition features the dark side of love, with unique interpretations from eighteen artists and one writing project. The works follows the emotional and pathological experience one can go through; including joy, heartbreak, shame, anxiety, vulnerability and even euphoria. Incorporating daily mediums and subject matter, viewers can find paintings, prints, words, audio recordings and more to explore the emotion and its affects. Participating artists include Chen Zhe, who continues a decade-long research project with an encyclopaedia of psychological experiences, Lau Wai, with combined prints, Cici Wu, who explores moving-images with light, and Wu Chi-Yu, Shen Sum-Sum, and Musquiqui Chihying, who present audio fragments and love stories.